How many times have you watched “The Karate Kid”? I’m talking about the one with Pat Morita and Ralph Macchio as Mr. Miyagi and Daniel Larusso. Yes, the original one from 1984. By the way, can I tell you a little secret? I didn’t think much about the film when I watched it for the first time. However, I began liking it more as I grew older. Call it an acquired taste, if you want. As much as I enjoy watching “The Karate Kid”, I wouldn’t call the film a masterpiece. The plot is predictable and the acting is average. However, the film has a heart. You see, there are many visually stunning films that fail to connect. Why? They lack that “warmth” that’s necessary for one to engage with the film. Personally, I believe “The Karate Kid” is highly relatable because we’ve all been in Daniel’s shoes (in some way). However, most of us were not as luck as Daniel to have a Mr. Miyagi to guide us. As I said before, the film is not flawless. Nonetheless, it has a lot of teachings that are noteworthy. Having said that, today I’m here to some share some life lessons I’ve learned from watching “The Karate Kid”. Daniel didn’t ask to be bullied. He was just the new kid in town, which made him an easy target. Tough times shouldn’t be viewed as a punishment. Why? Because you also learn from the bad things that happen to you. As ironic as it might sound, adversity and growth go hand-in-hand. From Daniel’s journey, one can see that there are no shortcuts. That’s exactly why a great building cannot be built on a weak foundation. 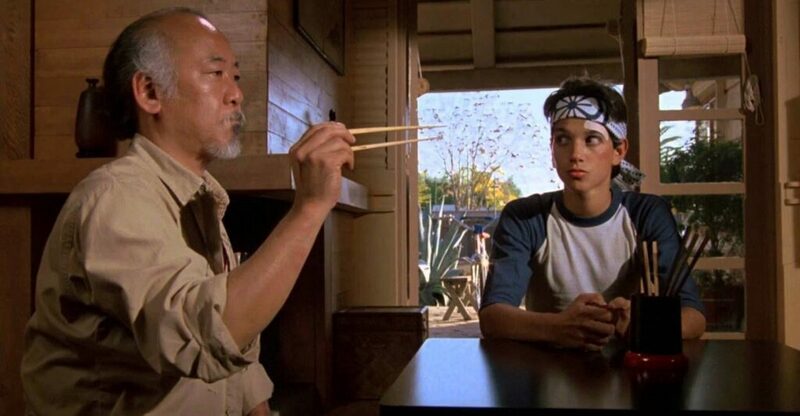 Having said that, when Mr. Miyagi was telling Daniel to “wax on, wax off” his car, he wasn’t taking advantage of this young boy. No. He was teaching Daniel how to build a strong foundation. The film really shows the importance of having good mentors in your life. Take Mr. Miyagi as an example. Everything he teaches Daniel has a purpose. His teachings are all about spiritual growth. Now, the bully’s mentor is the total opposite of Mr. Miyagi. He’s also a mentor, but he’s using his knowledge to teach his students to hurt and take advantage of others. That’s why Daniel and Johnny (the bully) turned out to be such different people. Things are not always going to be in your favour. However, that doesn’t mean you have to give up. When Daniel was injured during the tournament, he continued fighting. He didn’t have to, it was a choice. Daniel chose not to give up, even when he knew his chances of winning were very slim. That’s it, these were the most meaningful life lessons I’ve learned from watching “The Karate Kid”. By the way, there’s a remake of this film. As always, I’m very hesitant about remakes. Having said that, for those who haven’t watched the film I would suggest watching the original first.